To apply, Polaar say to gently squeeze the tube to allow a small amount of product to appear at the tip. You then need to gently roll the ball applicator from the inner corner of the eye to the outer corner and then massage in the gel. Finish by applying some on the lash line. With some cooling eye products you only feel a slight tingle or cooling sensation, but with this one you really do feel it. 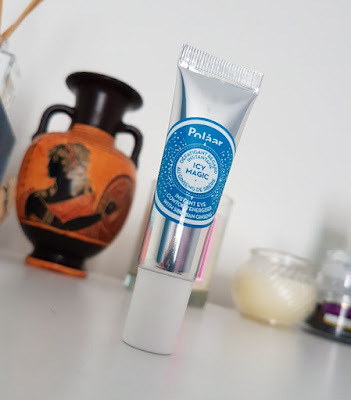 Combined with the rollerball (which helps with any cooling eye product) there is definitely a lovely pick me up, and because of that it has become one of the highlights of my mornings. What is also interesting is the fact that this eye gel actually has a subtle shimmer in it. It took me a while to even notice, that's how subtle it is, but it is there. This means that once the gel has been massaged into the eye area, there is an instant brightening effect. I tried it out on the back of my hand to see if I could get a photo of the shimmer but I failed. However, in person, you can also see the instant brightening effect on the back of your hand too, which is great I guess if you want to check it out in store anywhere before purchasing. I have found that it has done a great job at reducing morning puffiness, and it also helps somewhat with dark circles. I think it is too early to give full on feedback regarding both the long term effect on dark circles and eyelash growth as products like this do not work overnight, but so far it has been working well. On the Birchbox website it does seem to have a few negative reviews, but then the majority of those are regarding the packaging. Personally I didn't have any issues with getting the product from the tube. A gentle squeeze was enough to dispense a small amount of product and for the rollerball to glide across the skin nice and gently without tugging. I have used rollerballs that have dragged around the eye area in the past so I understand that it is uncomfortable, but with this particular product it seems to be hit or miss as to whether or not it happens. With that said, this also brings me back to the original confusion regarding the packaging. The reviews on the Birchbox site are about the squeeze tube roll on that I have, but the other two packaging options may be different in this respect. Either way, I'll reiterate that I had no problems with mine and I was able to use the product well and feel the benefits. For me, the best part about this product is how amazingly it helps to wake you up and helps to brighten the eye area. I think different eye products have their own pros and cons, and for this one, the pros are definitely the energising feeling and the unique selling point of eyelash growth stimulation (even though I can't yet comment on that, like I stated above). The cons appear to be the packaging for a lot of people and the roller ball tugging on the skin in particular. This is now the third product by Polaar that I have tried and once again, for me, it is a hit. This makes me feel really excited to try more products by them in the future as they are showing great reliability with their claims. If you are interested in taking a look at more Polaar products too, I do have a review of their Polar Night Cream which I am still in love with to this day. As for the contrasting reviews, thankfully the Icy Magic roll on isn't the most expensive eye product on the market (although £22 may still be enough to put people off, some eye products are far, far more expensive, so thats the scale I'm referring to here). I still highly recommend it, and if it fits within your price range then I say to not hesitate in giving it a try and not to let the bad reviews regarding the packaging to deter you. If you want to give it a try, you can purchase the Polaar Icy Magic Instant Eye Contour Energiser from Birchbox. Also, if you sign up to Birchbox this month via my link during September, you can get yourself £5 off your first box! This means that you will receive the same 10ml Polaar Icy Magic roll on in your box, alongside a full-size Manna Kadar Fantasy 3-in-1 blush/eyeshadow/highlighter (RRP £15) and a handbag size Dr.PAWPAW Original Balm along with other goodies for less than £10, and guys, that's really not too bad at all! What are your thoughts on the Polaar Icy Magic Instant Eye Contour Energiser? Are you a morning person or do you need a cooling boost in the morning too? 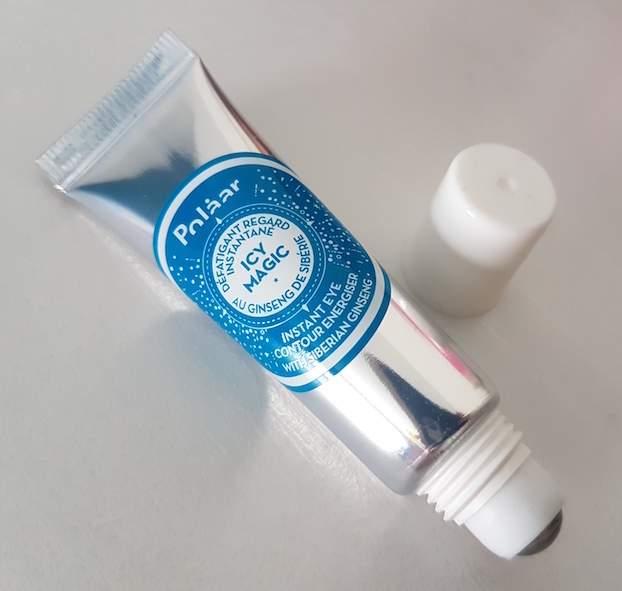 Thanks for giving reviews on Polaar icy magic instant eye contour. It was very much needed. I was bit skeptical before whether to buy it or not but now after reading your reviews I am gonna purchase it.